Ella, Sri Lanka is more than a small tourist town inland. There you will feel as though it has been designed for you. The destinations, the people, the adventures, the food, the accommodations await you with a touch of experience and warmth. 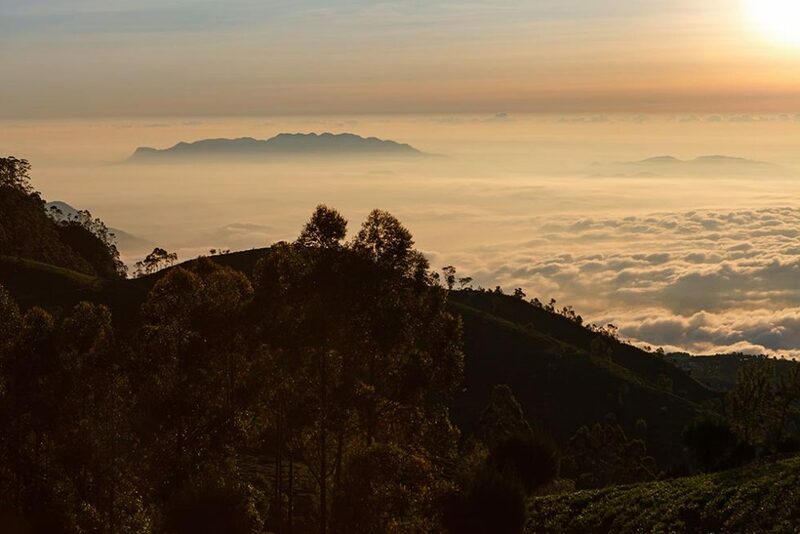 Surround yourself in the fields while relaxing in the hills of the Little Adams Peak, that is, graced by the view of the tea plantations on the Nine Arches Bridge. Who knows what you really want is the adrenaline rush of trekking on Ella’s biggest mountain? Welcome to Ella, what you will find there is all that and a little more than your body can bear. Speaking of supporting, after the adventures, know the restaurants of the city and savor the best of local food without restriction. Although Ella is small, she holds beautiful, cozy accommodations with surreal views. Ella invites you to another adventure, only this time more radical and natural. Choose how you want to live this experience and make this adventure the best of your trip to Sri Lanka. Where is Ella in Sri Lanka? How do move around in Ella? How to get from Ella to Nuwara Eliya, passing by Hortons Plains? What are the best restaurants in Ella? Places to stay in Ella? How many days to stay in Ella? 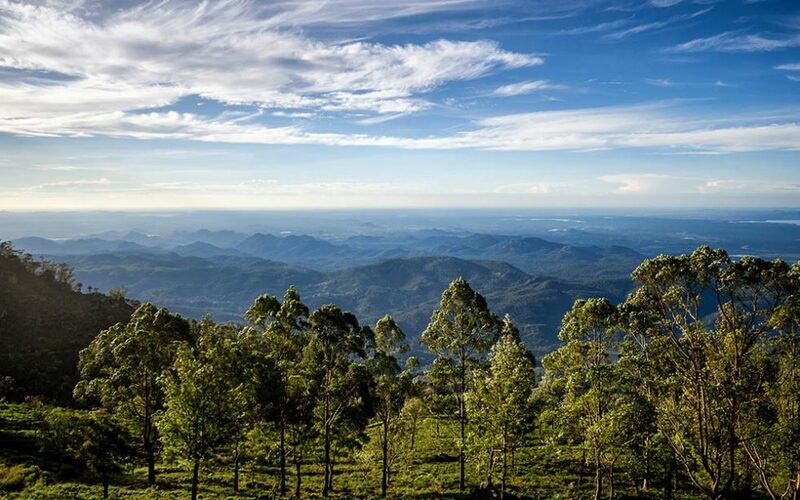 Ella is a city located on the Central Plateau of Sri Lanka, about 1041 meters above the sea. Outside the sweeping sidewalks in and around, it has two main streets well equipped with restaurants and hotels to suit all tastes. This city has approximately 45 thousand inhabitants and is about 200 km from Colombo. 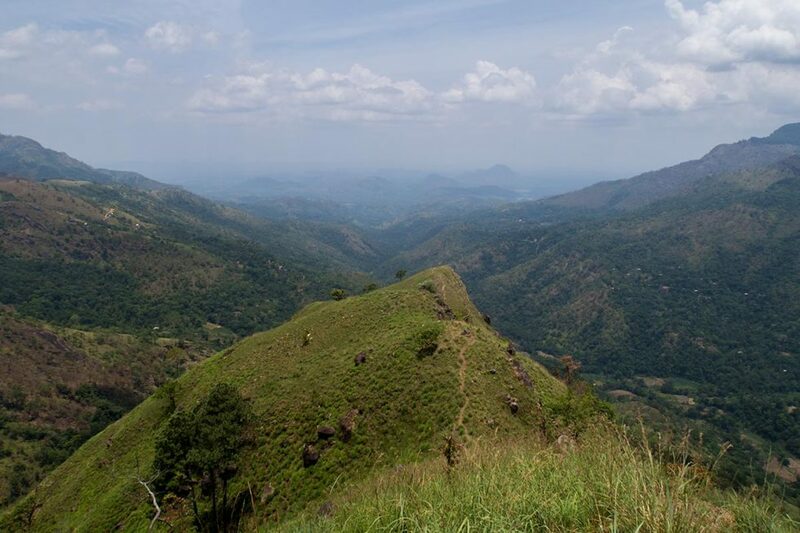 Ella is the arrival point of a scenic and exciting trip from or to Kandy and, if you desire, it is also the starting point for Horton Plains and Nuwara Eliya. Make no mistake, although Ella in Sri Lanka is a small village, she has many options to do and surprise yourself with the city. Let’s begin our trip around Ella, Sri Lanka, and we hope you enjoy this ride, exploring what we separate for you with many expectations of leading you to a surreal experience. Ella is truly impressive and, for sure, will push you to overcome your own limitations. Come with us! Little Adams Peak is much smaller than Adams Peak. If you depart from the city, it will last about 45 minutes to reach the mountain, and with another 15 minutes, you reach the top of the peak. This place is ideal for a radical 2 hours trekking. Along the way, you will pass through local villages, and you will see the beautiful tea plantations. As you go up the hill you will find calm and quiet places and looking down you will see the small roads as if they had been drawn in the imperfections of the mountain. Keep walking that you will arrive at a dirt staircase towards a Buddha statue. Then you will be absorbed by the two hills where you will contemplate several impressive landscapes. 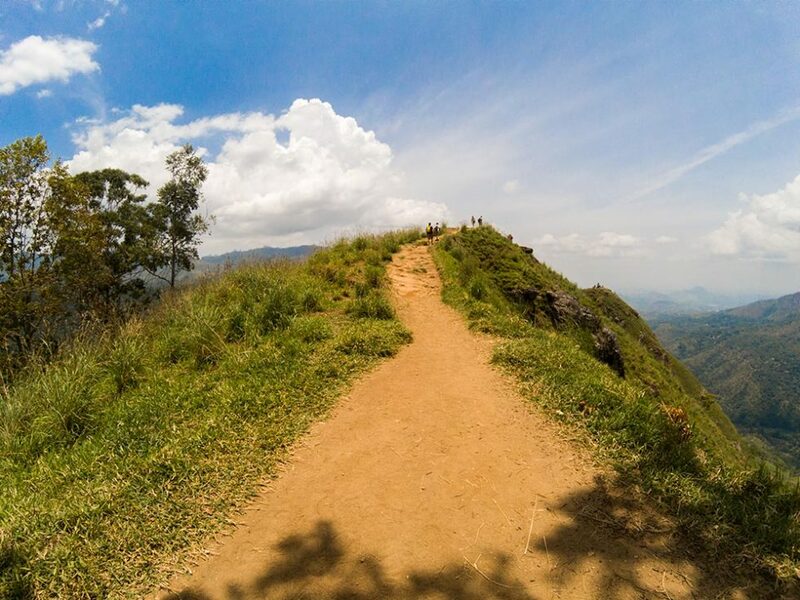 As you walk through the peaks of Little Adams Peak, walk through the grass (if it is dry) holding onto the rocks cautiously because the descent into the dirt is slippery and you risk falling. Ideally, you must trek through all three peaks and enjoy the breathtaking and inspiring views in the first hour of the day or in the late afternoon to watch the sunset. 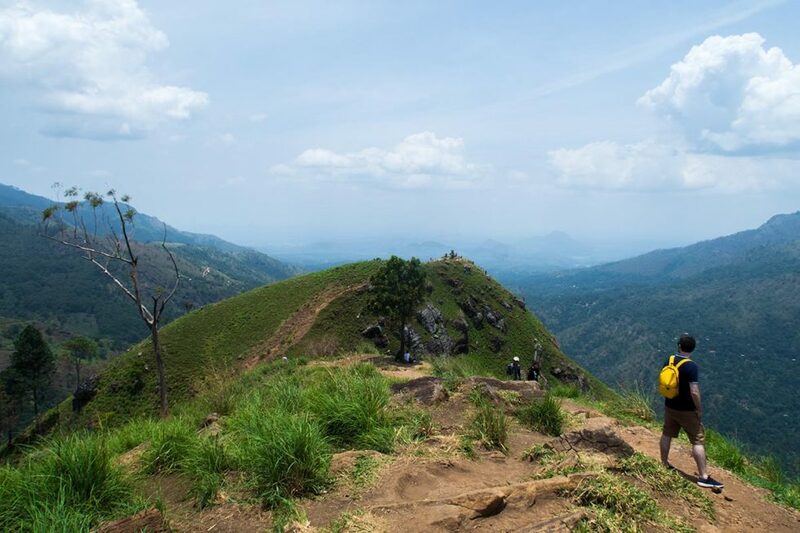 After surpassing the Little Adams Peak, adventure to a more significant challenge and up to Ella Rock. The Ella Rock trekking will require your energy and disposition. Even if the sun is scorching, you will be protected by the shadows of the trees. If you go in the late afternoon to spend the sunset, you’ll be disappointed. The hill has no visibility to the place where the sun sets. The course lasts 4 hours: 2 hours to climb and 2 hours to descend. Before you go, you need to take a rickshaw to Waterfall Street, and from there you start your trekking. Pay attention to the guides who are waiting for you, to ask for extreme values just to take you to the top. You can well avoid it you can risk it alone or with the company of a guide. Just be careful to choose a professional who knows what you are doing. Ideally, ask your hotel/hostel for a reliable guide. Since the course is actually somewhat complicated, use the Maps.Me app instead of hiring a guide. You’ll notice that this APP is similar to Google Maps, but the big difference is that it provides routes and tracks that have been shared by other travelers. You will not only save money, but you will enjoy better this experience even more radical and independent. 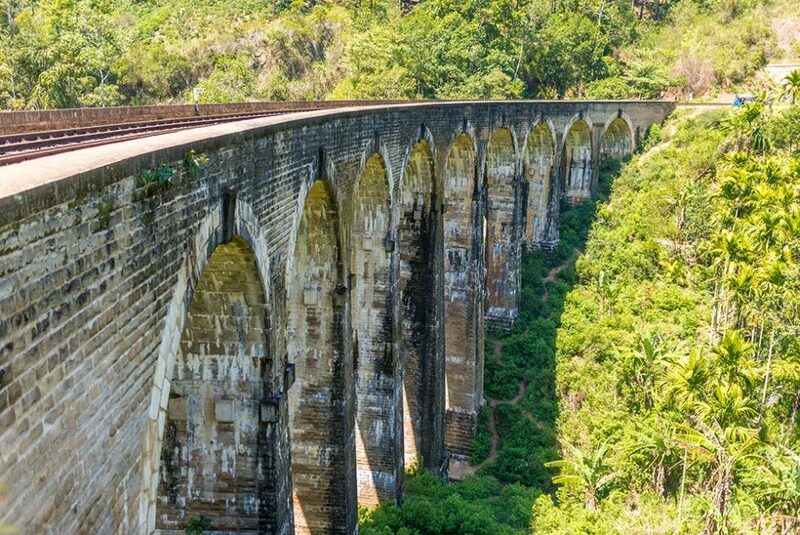 The famous Nine Arches Bridge (Nine Arches Bridge) was built by the British, initially made of steel. It is about 220 meters high and is located between Ella and Demodara. Do you know those posters and posts that publicize Kandy’s scenic trip to Ella? So what you’ll see here and a little further ahead of Ella’s station. The forest walk takes 30 minutes. 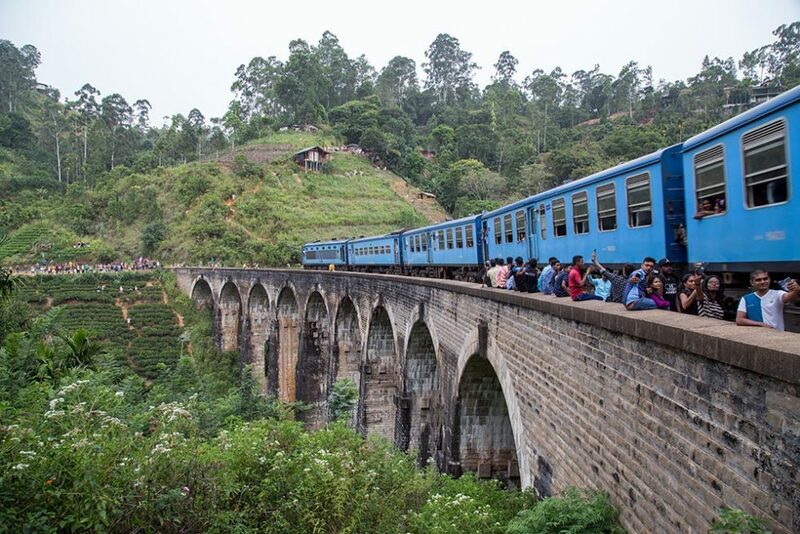 If you are on the train in the direction of Kandy to Ella and do not go out in Ella, you will cross the bridge railway. From there you can walk to the station and walk about 40 minutes, the equivalent of 5 km. Now if you are returning from the Little Adams Peak trekking, take the opportunity to follow the bridge (there are signs), the route takes about 25 minutes on foot. During hiking, you will be graced with a radical experience in the middle of the narrow fields and the trees surrounding you as if you were to swallow. Upon reaching the bridge, you will be rewarded with a sight of tea plantations in the middle of dense jungles. The images are of heart-wrenching! You’ll soon see the bridge and have a global view of people. Take the opportunity to order a natural juice and check the schedule of the next train. During the wait, take another juice record this moment as you hear the sound of the train approaching the geometric curves of the bridge. They are usually quite large, so some times occupy the entire line, between the exit and the entrance in the other tunnel. If you are coming from the train station in Ella, you will see the train passing to you. It does not lack exciting points of view to see the train closely. A trip to Lipton’s Seat takes up half a day. Program to go in the morning or afternoon. First, take the train that will take you to Haputale. Then a tuk-tuk to the top where you will see the result of the few seeds that Mr. Lipton sowed in 1890 and today has become one of the country’s most significant export sources, the Lipton Tea tea plantations. From the heights, you will lose with the vastness of the plantations and how women choose the best leaves to prepare the teas. The image is as intense as if it seems that the fields are smiling at you so well taken care of. It is indeed more of an experience for you to live in It. Diyaluma Falls is Ella’s largest waterfall. It is recommended that you book all day to enjoy all the energy that the place has to free you. You can leave Ella and go by car, taking about 1 hour. Then climb another 30 minutes to the top of the waterfall. Another 45 minutes and you’ll reach a place surrounded by the most surreal natural pools. Pay attention to the danger signs. Unfortunately, many adventurers have already died in this place. Ella Spice Garden is a school that teaches the secrets of Sri Lankan cuisine..
Take advantage and check availability to learn how to cook the tastiest local foods. It is essential that you check the availability of places and reservations in advance. Usually, the classes are crowded. 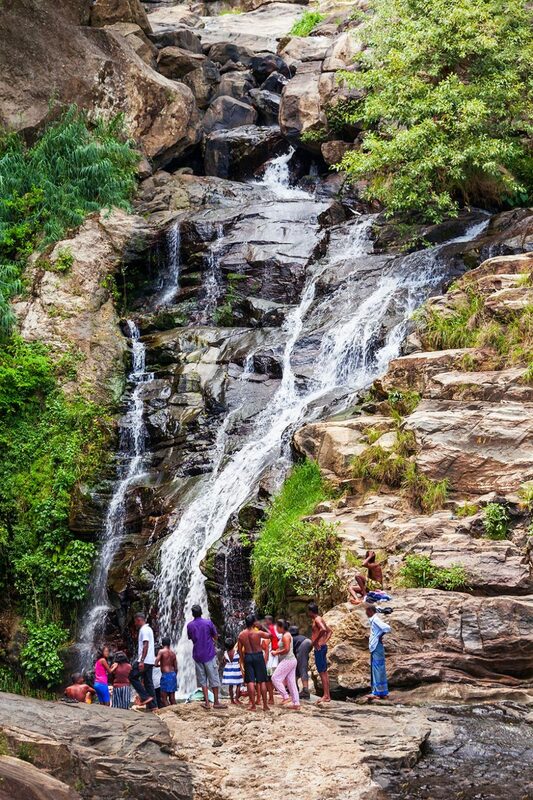 The Ravana is a cascade surrounded by a lush plantation and a secret cave. About 10 minutes from Ella, you reach the other side of the central city road. This place is trendy for quick dives since the access is more straightforward than the Diyaluma waterfall. You should also visit the (mysterious) cave and a temple that was built in memory of Ravana – who stole Sita’s wife (Ramayana story). 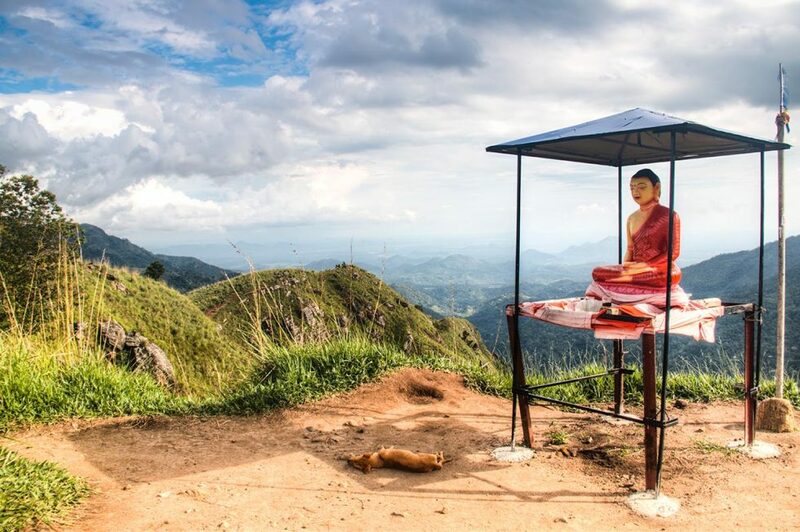 The place is not much explored by travelers, but it is worth being visited on your trip through Ella. Dowa Rock is a temple a few miles from Ella. You can go by tuk-tuk or even walk. The Temple protects a statue of Buddha carved from the rock. It was built with a stupa in the center resulting in a magnificent contrast. The Market in Ella is the typical market that opens on Wednesday mornings. In there you can find small shops that sell clothes, vegetables, fruits, spices, and fruits. Ella is a small town, it is perceived that the attractions are nearby being possible to walk, but not for all places. To visit Ella Rock, the waterfalls of Diyaluma, and other places you will need to take a tuk-tuk. Unlike some other cities, the drivers in Ella are very friendly but do not forget to negotiate with them. With that in mind, we have prepared a full article on transports in Sri Lanka, and we guarantee that with the secrets we reveal, you will be well informed on how to negotiate with local drivers and not be taken by surprise. 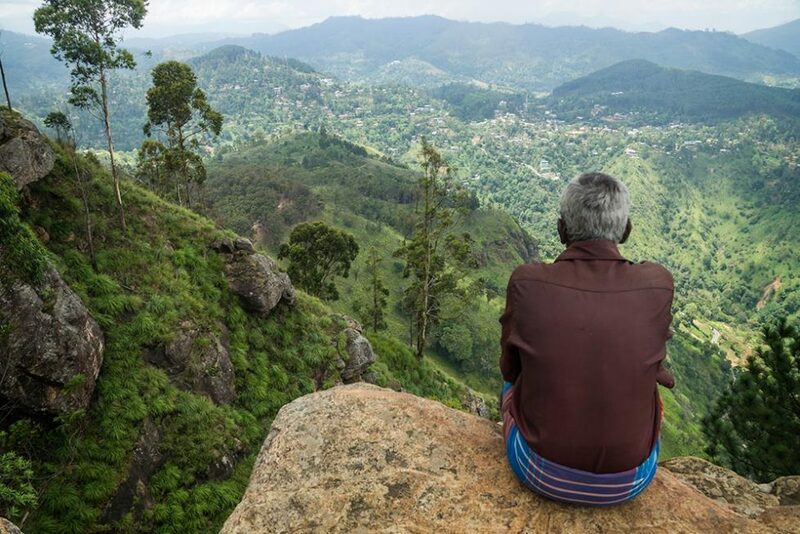 Since you’re in Ella, what about considering Nuwara Eliya as the next place to visit? You can enjoy and go through Hortons Plains and even save some time. With this, you enjoy your trip even more. Check your hotel for a jeep with a driver that will take you to Hortons Plains early in the morning, and wait for you there. He will take and leave you in another city, Nuwara Eliya. As you will notice that Hortons Plains does not have many options, other than the main highlight, the natural park, go early in the morning and after, go to another city. If you are in Ella, rent a jeep with a driver to take you to Hortons Plains and from there to Nuwara Eliya. 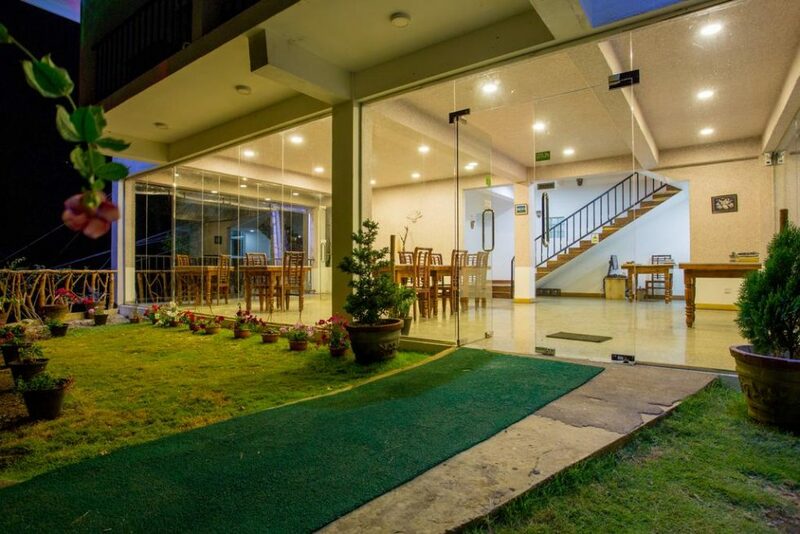 Ask, schedule in advance at the hotel where you are settled and make an excellent negotiation to take you to Hortons Plains and proceed to Nuwara Eliya. The cost is around 3000 rupees. But is well worth it, as you will not only see one of the most beautiful parks in Sri Lanka, but you will save time on your trip. To be able to take Ella’s adrenaline you need to be well fed, but do not worry, Ella has incredible restaurants and bars that serve various types of food. Serve yourself with our best options. 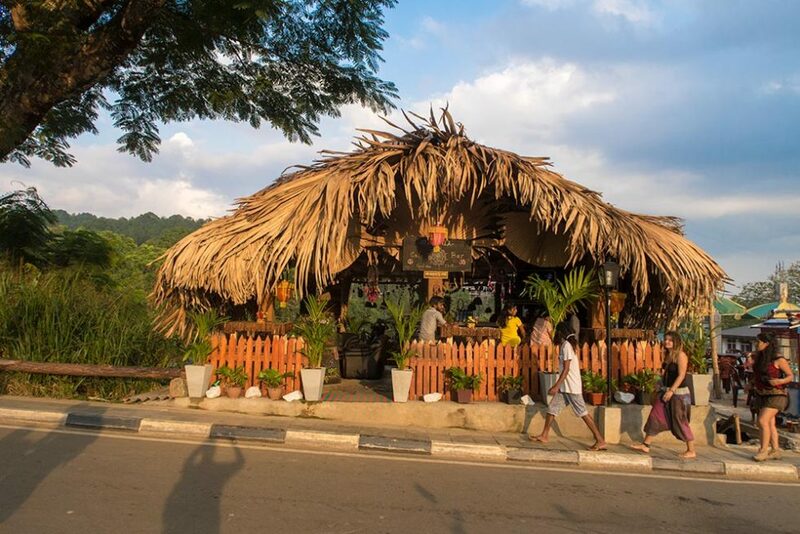 Cafe Chill is Ella’s most famous restaurant which is located on the main road. They serve cold foods: detox smoothies, burgers, and pizzas. Take advantage to go during the day as it is busy but well laid out. At night you can enjoy good music, meet other travelers and have a refreshing drink. The Ella Village Inn is a restaurant/bar located just off the station on the left. The place is excellent and has a stunning landscape. It’s a nice place to visit as soon as you arrive on your train trip from Kandy to Ella and stop to relax while drinking a cold beer. The AK Ristoro is a bit further away from the main street, but it’s an excellent place to get food in Ella. Since the owner is Japanese, the restaurant serves pizzas, pasta, and traditional sushi. In Reincarnation is a cozy restaurant with three floors. It is next to Ella Spice Garden just off the main road. It serves Mexican foods with a Sinhalese flair: wrap, nachos, refreshing drinks. The place is ideal for, after a trekking stop, rest and people watching. Adam’s Breeze is a restaurant serving tasty Asian foods. It is right on Ella’s main street. Enjoy getting to know as soon as you return from the Nine Arches Bridge and Little Adams Peak. Choose the tables outside, in front of the fields or inside. The place is entirely worth it. 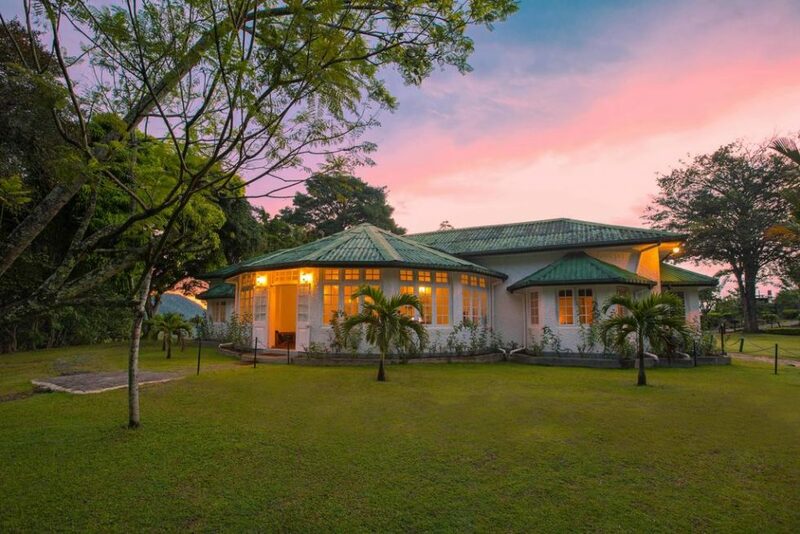 Ella has one of the most privileged accommodations in all Sri Lanka. Almost all hotels and hostels we suggest have views to the tea fields or the mountains that create surreal images. Check out the best hotels and hostels to stay in Ella. 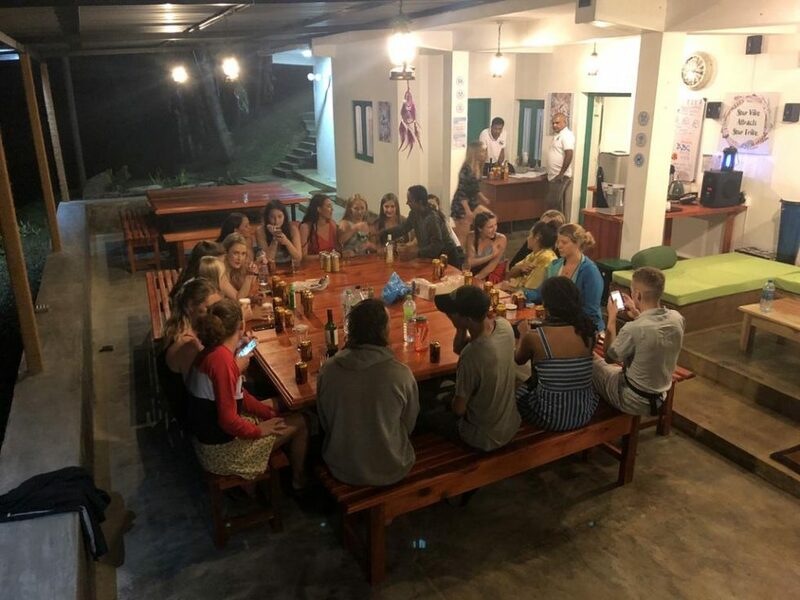 Ella Escapade Hostel is a cozy hostel where you will find another backpackers. It’s close to Little Adams Peak and Ella Rock. The hostel hosts are very helpful. Breakfast is included, as also the pool and the wifi with high speed. The downside is the distance. Despite being close to the center, it will take about 30 minutes to get to the trails. But nothing that you cannot solve with a tuk-tuk ride. The Residence is a house where rooms are rented. 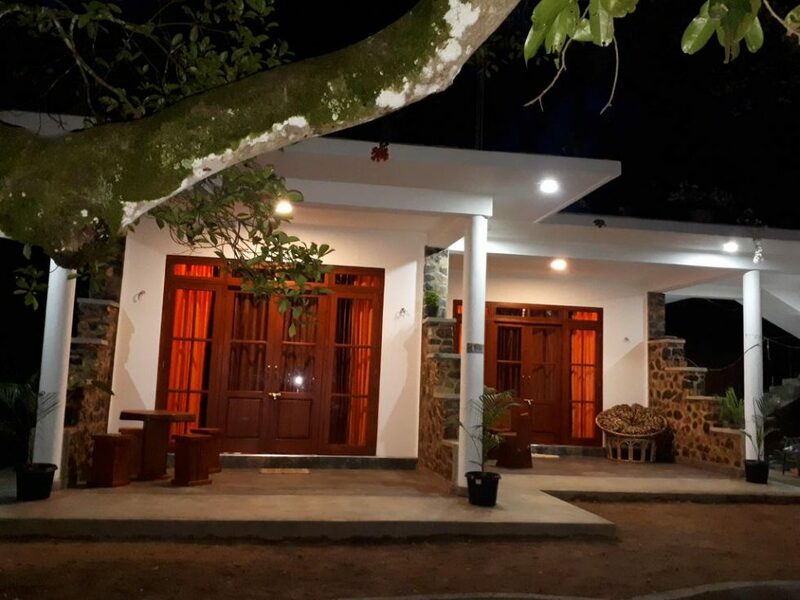 It is located near the rails to Little Adams Peak and Nine Arches Bridge and offers internet throughout the house and a beautiful garden to relax. It also offers bicycle and car rental services for private accommodation. 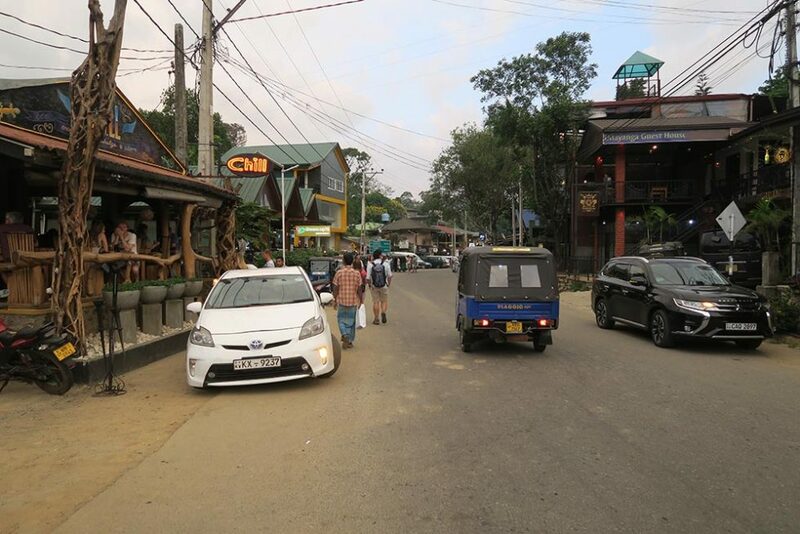 Talk to the owners and rent the jeep to take you to Hortons Plains and Nuwara Eliya (as we suggested above). Ella Village Inn is a cheerful hotel and in every detail demonstrates the energy of Sri Lanka. It is located in a very central area of Ella. The place charms for simplicity, the accommodations (double or single bed) are modest and clean bathrooms. The hotel offers a safe, and you can book trips and tours. If required, just ask for laundry and dry cleaning services at the front desk. The in-house restaurant serves a variety of Western and Oriental foods. Another option is to order meals in the privacy of your room. The Secret Ella is a resort that is close to Ella station with an impressive view of the mountains. There you will feel at home with very comfortable accommodation, outdoor pool, room service, and excellent service. The facilities at the resort are so relaxing, and at the same time, luxurious that will undoubtedly be a perfect retreat in your trip to Ella. The Tenth Hotel is a modern and simple accommodation. It is located close to the train station. It’s actually one of the best places to stay in Ella, with incredible views of Ella mountains. There you will have the option to relax in the living room of your room or go out to breathe some fresh air in the garden. They offer non-smoking rooms, free Wi-Fi and free parking, as well as an airport transfer. The Ella Jungle Resort is a luxury in the middle of nature. This resort is close to the cascades, train station and Ella’s main road. The decision is yours: choose to walk through the surrounding jungle, enjoy the view or take that dip and do trekking. The resort accommodations are comfortable, and you can be carefree because they have some musketeers, so you do not have problems with mosquitoes. In Ella, the climate is colder compared to other regions like Negombo, Colombo, Kandy. That’s because this city receives a lot of rain throughout the year to keep the landscapes in the most vivid and green colors. Because of this, the summer has a short duration, the sky is more cloudy, and the temperatures range from 15ºC to 31ºC. Although you may find occasional rains, the best time to visit Ella is between the beginning of January and the beginning of April. It avoids traveling between December and March in which the northeast monsoon arrives at the city causing storms and rains above normal. We have an article about the best time to visit Sri Lanka and outline the best city map to visit on this resplendent island. As you realized, Ella is for nature lovers, and they dare to bet on radical adventures. 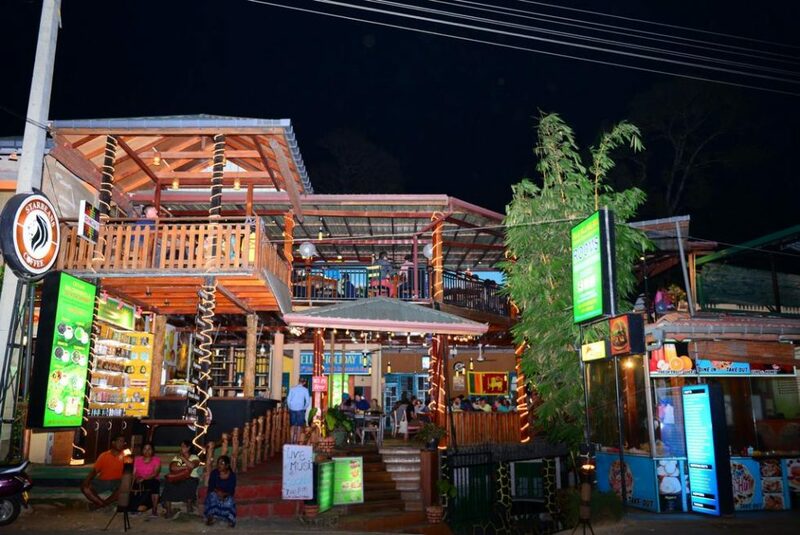 Also, it is the end of a trip from Kandy to Ella and 100% dedicated to tourism, so there you will find some of the best restaurants and hotels with reasonable prices. 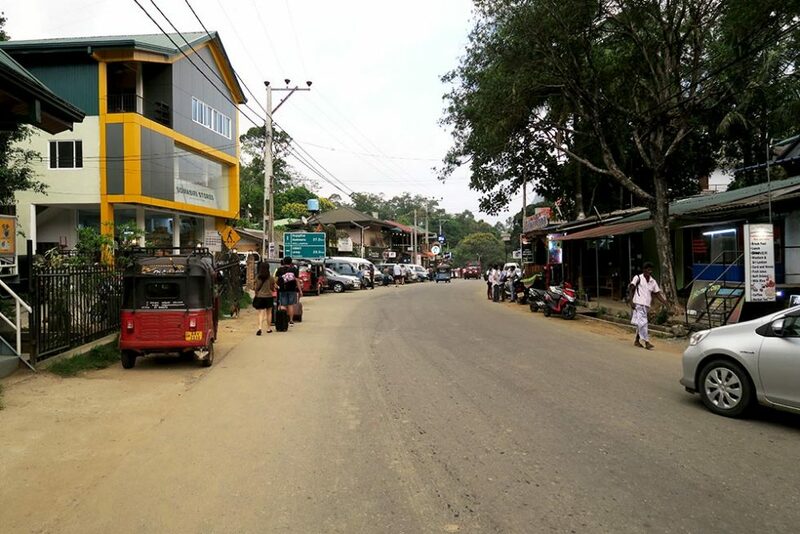 3 days in Ella should be enough to do and see all the main things, and then move on to other cities like Nuwara Eliya passing through Hortons Plains (as we suggested above). Now the weather, the people, the atmosphere, the attractions are really an invitation to stay more days in Ella. Did you like this article on Ella – Sri Lanka? Did you see how the place really is a jewel in the middle of the jungle? Then start by checking what you need to know to get your tourist visa to plan your trip with the Visa Sri Lanka Online: A Complete Walkthrough. Ella Sri Lanka é mais do que uma cidadezinha turística do interior. Você vai sentir como se tivesse sido desenhada para você. Os destinos, o povo, as aventuras, a comida, as acomodações lhes esperam com o toque de aventura e aconchego. Seja acolhido pelos campos enquanto relaxa nas colinas do Little Adams Peak, ou seja, agraciado pela vista das plantações de chás na Ponte Nove Arcos. Quem sabe o que você deseja mesmo é a adrenalina de fazer trekking na maior montanha de Ella? Seja bem-vindo Ella é tudo isso e um pouco mais que o seu corpo possa suportar. Falando em suportar, após as aventuras, conheça os restaurantes da cidade e saboreia o melhor da comida local sem restrição. Embora Ella seja pequena, ela guarda acomodações aconchegantes a seu gosto e com vistas surreais. Ella convida você para mais uma aventura, só que dessa vez mais radical e natural. Escolha como deseja viver essa experiência e faça dessa aventura a melhor de sua viagem ao Sri Lanka. Onde fica Ella Sri Lanka? Como se deslocar em Ella? Como ir de Ella para Nuwara Eliya passando em Hortons Plains? Quais são os melhores restaurantes em Ella? Ella é uma cidade localizada no Planalto Central do Sri Lanka, mais ou menos a 1041 metros acima do mar. Fora os passeios radicais dentro e pelas redondezas, ela possui duas ruas principais bem equipadas com restaurantes e hotéis para todos os gostos. Essa cidade conta com aproximadamente 45 mil habitantes e fica a cerca de 200 km de Colombo. Além disso, Ella é ponto de chegada de uma viagem pitoresca e emocionante de Kandy e caso queira, é o ponto de partida para Hortons Plains e Nuwara Eliya. Não se engane, embora Ella no Sri Lanka seja uma pequena aldeia, ela tem muitas opções para você fazer e se surpreender com a cidade. Como dizemos, sinta-se estimulado a explorar o que separamos para você com muitas expectativas de levá-lo a uma experiência surreal. Os destinos de Ella são realmente impressionantes e convidativos para você superar as suas próprias limitações. Venha conosco! O Little Adams Peak é bem menor do que o Adams Peak (Pico de Adão). Saindo da cidade até a montanha dura cerca de 45 minutos e com mais 15 minutos você já alcança o topo do pico. Esse lugar é ideal para você fazer trekking bem radical em 2 horas. No decorrer do caminho você passará pelas aldeias locais e verá as belíssimas plantações de chás. À medida que for subindo a colina. Você encontrará lugares calmos e tranquilos e ao olhar para baixo você verá as estradas pequenas como se foram desenhadas nas imperfeições da montanha. Continua caminhando que você chegará a uma escadaria, terra batida rumo à uma estátua de Buda. A seguir você será contemplado pelos dois montes onde contemplará várias paisagens impressionantes. Ao retornar, venha pela relva (se estiver seca) segurando-se nas pedras com cautela porque a descida em terra batida é escorregadia e corre risco de você cair. O ideal é você percorrer os três picos e aproveitar as vistas impressionantes e inspiradoras na primeira hora do dia ou ao fim da tarde para contemplar o pôr do sol. Após superar o Little Adams Peak, permita-se a um desafio maior suba até Ella Rock. O trekking de Ella Rock exigirá de você energia e disposição. Embora se o sol estiver escaldante, você será protegido pelas sombras. Só que se você for no finalzinho de tarde esperando encontrar o pôr do sol, você será decepcionado. A colina não possui visibilidade para o lugar que o sol se põe. O percurso dura 4 horas: 2 horas para subir e 2 horas para descer. Antes de ir você precisará pegar um rickshaw para a Rua Waterfall e dali em diante inicia o seu trekking. Fique esperto com os guias que ficam o esperando, eles pedem valores exorbitantes só para levá-lo ao topo. Você pode arriscar sozinho ou com a companhia de um guia. Só tenha o cuidado de escolher um profissional que saiba do que está fazendo, se puder, verifique com o seu hotel/albergue um guia de confiança. Como o percurso é realmente um pouco complexo, baixe o app Maps.me no lugar de contratar o guia. Perceberá que esse aplicativo é semelhante ao Google Maps, mas o diferencial é que ele disponibiliza uns trajetos e trilhas que foram compartilhados por outros viajantes. Esse diferencial o fará economizar em sua viagem e a sua experiência será ainda mais radical e independente. A famosa Ponte de Nove Arcos foi construída pelos britânicos dizem que foi de aço. Ela possui cerca de 220 metros de altura e fica localizada entre Ella e Demodara. Sabe aqueles cartazes e posts que divulgam a viagem cênica de Kandy para Ella? Então, o que você verá é aquilo e um pouco mais. A diferença é que a caminhada pela floresta dura 30 minutos. Se você estiver no trem no sentido de Kandy para Ella e seguir à estação até atravessar a ponte do trem. Outra opção é que você pode ir até a ferrovia e andar cerca de 40 minutos, o equivalente a 5 km. Agora se estiver vindo do trekking do Little Adams Peak, aproveite para voltar rumo a essa ponte (existem sinalizações), o percurso é de 25 minutos a pé. Durante caminhada você será agraciado com uma experiência radical em meio aos campos estreitos e as árvores cercando-o como se fossem engolir você. Ao chegar a ponte você será recompensado com uma vista farta de plantações de chás em meio a densas selvas, as imagens são de arrebatar o coração! Logo você verá a ponte e terá uma vista global das pessoas. Aproveita para pedir um suco e verificar o horário do próximo trem. Durante a espera, tome mais um suco registre esse momento enquanto escuta o som do trem que se aproxima pelas curvas geométricas. Eles costumam ser bem grandes, então há momentos que ocupam toda a linha, entre a saída e a entrada no outro túnel. Caso esteja vindo da estação de trem de Ella, verá o trem passando ao seu lado. Ali não faltam pontos de vista interessantes para ver o trem de perto. O assento de Lipton é aquela viagem que ocupa meio período do seu dia. Programa-se para ir pela manhã ou à tarde. Primeiro pegue um trem que o levará até Haputale. Depois, pegue um tuk tuk até ao topo onde você verá o resultado das poucas sementes que o sr. Lipton semeou em 1890 e hoje se transformou em uma das maiores fontes de exportação do país, as plantações de chás Lipton Tea. Das alturas você se perderá com a imensidão das plantações e de como as mulheres escolhem as melhores folhas para prepararem os chás. A imagem é tão intensa parecendo que os campos estão sorrindo para você de tão bem cuidados. Certamente é mais uma experiência para você sentir em Ella. A Diyaluma Falls é a maior cachoeira de Ella. O recomendado é que você reserve o dia inteiro para usufruir de toda a energia que o lugar tem para liberar sobre você. Você pode sair de Ella e ir de carro e levará cerca de 1 hora. Depois suba mais 30 minutos até o topo da cachoeira. Caminha mais 45 minutos e chega a um lugar cercado pelas piscinas naturais mais surreais de sua vida. Só tome cuidado com as placas que sinalizam perigo, infelizmente muitos desavisados já morreram nesse lugar. O Ella Spice Garden é uma escola que ensina os segredos da culinária cingalesa. Aproveite e verifique a disponibilidade para você aprender a cozinhar as comidas mais saborosas do local. É importante que você verifique a disponibilidade de vagas e reserve com antecedência, geralmente as classes ficam lotadas de aprendizes. A Ravana é uma catarata cercada pela exuberante plantação e por uma caverna secreta. Cerca de 10 minutinhos de Ella que você chegará ao outro lado da estrada principal da cidade. Esse lugar é muito popular para mergulhos rápidos já que o acesso é mais simples do que da catarata de Diyaluma. Além disso, ele recebe breve visitas para verem a caverna (misteriosa) e um templo que foi construído em memória a Ravana — que roubou a esposa de Sita (história de Ramayana). O lugar não é muito explorado pelos viajantes, mas vale a pena ser visitado em sua viagem a Ella. O Dowa Rock é um templo que fica a alguns quilômetros de Ella. Você pode ir de tuk tuk ou até mesmo a pé. O Templo protege uma estátua de Buda esculpida na rocha. Ele foi construído com uma estupa no centro que resulta em um contraste magnífico. O Mercado em Ella é o típico mercado que abre nas manhãs de quarta-feira. Esse mercado é repleto de comércios que vendem roupas, legumes, frutas, especiarias e frutas. Ella é uma cidade pequena, percebe-se que as atrações são próximas sendo possível ir a pé, mas não em todos os lugares. Para visitar o Ella Rock, as cataratas Diyaluma, e outros lugares vai precisar de pegar tuk tuk. Diferente dos outros lugares os motoristas em Ella são camaradas, mas não deixe de negociar com eles. Pensando nisso, preparamos um artigo completo sobre os transportes no Sri Lanka e garantimos que com os segredos que revelamos, você estará bem informado sobre como negociar com os motoristas locais e não ser pego de surpresa. Já que está em Ella que tal passar em Nuwara Eliya? Passe pelo Hortons Plains que você economiza tempo. Com isso você aproveita ainda mais a sua viagem. Verifica no seu hotel um jipe que o leve para Hortons Plains e aguarde. Ele o levará e o deixará em outra cidade, Nuwara Eliya. Como perceberá que Hortons Plains não tem muita opção para passeio, fique o período matutino e depois siga para outra cidade. Caso esteja em Ella, você aluga um jipe com o motorista para o levar até a Hortons Plains e de lá seguir para Nuwara Eliya. Pergunte, agende com antecedência no hotel que estiver instalado e faça uma boa negociação para o levar até Hortons Plains e seguir para Nuwara Eliya. O custo fica em torno de 3000 rupias. Mas qualquer um desses trajetos vai fazê-lo ganhar tempo em sua viagem no Sri Lanka. Para conseguir suportar a adrenalina de Ella você precisa estar bem alimentado, mas não se preocupe, Ella tem restaurantes e bares incríveis que servem vários tipos de comidas. Sirva-se com as nossas melhores opções. O Cafe Chill é o restaurante mais popular de Ella que fica localizado na estrada principal. Ele serve comidas frias: detox smoothies, hambúrgueres e pizzas. Aproveite para ir durante o dia ele é agitado e bem descontraído. A noite vá para curtir uma boa música, conhecer outros viajantes e tomar uma bebida refrescante. O Ella Village Inn é restaurante que fica logo na saída da estação, à esquerda. O local é agradável e conta com uma bela paisagem. Aproveite para o visitar assim que chegar de sua viagem de Kandy a Ella e pare para relaxar e beber uma cerveja. O AK Ristoro é um pouco mais distante da rua principal, mas é um bom local para você se alimentar em Ella. Já que o proprietário é japonês, o restaurante serve pizzas, massas e o tradicional sushi. O In Reincarnation é um restaurante aconchegante que possui três andares. Ele fica próximo a Ella Spice Garden logo na estrada principal. Serve comidas mexicanas com um toque cingalês: wrap, nachos, bebidas refrescantes. O lugar é ideal para depois de um trekking parar, descansar e observar as pessoas. O Adam’s Breeze é um restaurante que serve comidas asiáticas bem saborosas. Ele fica logo na rua principal de Ella. Aproveite para conhecer assim que voltar da Ponte Nove Arcos e do Little Adams Peak. Escolha entre as mesas ao livre em frente aos campos ou no interior. O lugar é tranquilo vale a pena pelo custo-benefício. Como dito, Ella tem uma das acomodações mais privilegiadas. Em quase todos hotéis e albergues que sugerimos têm vistas para os campos de chás ou para as montanhas que rendem imagens surreais. Confira os melhores hotéis e albergues. O Ella Escapade Hostel é um albergue acolhedor. Ele fica próximo ao Little Adams Peak e do Ella Rock. Os anfitriões são atenciosos e prestativos. Eles servem café da manhã, disponibilizam a piscina e o wifi com alta velocidade. A desvantagem é a distância que embora seja próximo, você vai levar 30 minutos para chegar às trilhas. Mas nada que um tuk tuk resolva, certo? O The Residence é uma casa que onde os quartos são alugados. Ela fica localizada perto do trilho para Little Adams Peak e Nine Arches Bridge e oferece internet por cortesia da casa e um jardim gracioso. Ele também disponibiliza serviço de aluguel de bicicleta ou carro para acomodações particulares. Aproveite e fale com os anfitriões e alugue um jipe para o levar o Hortons Plains e Nuwara Eliya (conforme sugerimos mais acima). O Ella Village Inn é um hotel alegre e em cada detalhe exala a energia do Sri Lanka. O lugar encanta pela simplicidade, as acomodações (cama de casal ou solteiro) são modestas e os banheiros são confortáveis. O hotel disponibiliza o cofre, você consegue reservar viagens e passeios. E caso precise, é só solicitar os serviços de lavanderia e lavagem a seco na recepção. O restaurante interno serve uma variedade de comidas tanto ocidentais quanto orientais. Outra opção é solicitar as refeições na privacidade do seu quarto. O The Secret Ella é um resort que fica próximo à estação de Ella com uma vista impressionante para as montanhas. Você sentirá em casa com as acomodações confortáveis, piscinas ao ar livre, serviços de quarto e o excelente atendimento. As instalações do resort são tão relaxantes e ao mesmo tempo luxuosas certamente serão como refúgios para a sua viagem em Ella. O Décimo Hotel é uma acomodação moderna e simples. Ela fica situada pertinho da estação de trem. Na verdade, é um refúgio com vista para as montanhas de Ella. Você terá opção para relaxar na sala de estar em seu quarto ou sair para respirar o ar do jardim. Disponibilizam os quartos para não fumantes, wifi e estacionamento grátis, além do transfer para o aeroporto. 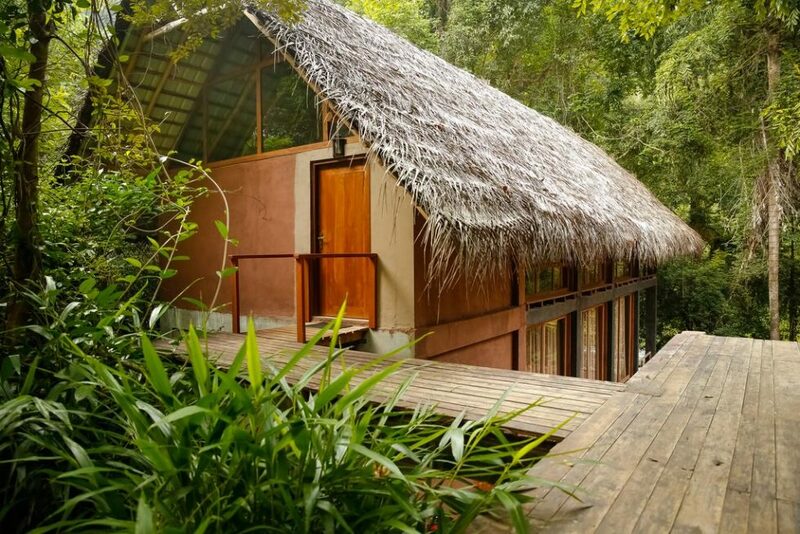 O Ella Jungle Resort é um luxo em meio a natureza. Este resort fica próximo a cachoeiras, estação de trem e rodoviária de Ella. A decisão é sua: escolha andar pela selva ao redor, apreciar a vista ou dar aquele mergulho e fazer trekking. As acomodações do resort são confortáveis e pode ficar despreocupado porque vêm com o mosqueteiro para você não ter problemas com mosquitos. Em Ella o clima é mais frio em comparação as outras regiões como Negombo, Colombo, Kandy. Isso porque essa cidade recebe muita chuva no decorrer do ano para manter as paisagens com as cores mais vívidas e verdinhas. Por causa disso, o verão tem curta duração, céu é mais nublado e as temperaturas variam de 15ºC a 31ºC. Embora você encontrará chuvas esporádicas, a melhor época para visitar Ella é entre o começo de janeiro até ao começo de abril. Evite viajar entre dezembro e março em que a monção do nordeste chega a cidade provocando tempestades e chuvas acima do normal. Temos um artigo sobre quando ir no Sri Lanka e trace o melhor roteiro de cidades para visitar nesta ilha resplandecente. Como você percebeu Ella é para os amantes de natureza e que têm coragem para apostarem em aventuras radicais. Além disso, é o fim de uma viagem de Kandy para Ella e 100% dedicada ao turismo, por isso são restaurantes e hotéis de primeira linha com preços razoáveis. O ideal é você fica 3 dias em Ella e depois seguir para outras cidades como Nuwara Eliya passando por Hortons Plains (como sugerimos acima). Agora o clima, as pessoas, o ambiente, as atrações são realmente um convite para você ficar mais dias em Ella. Gostou do nosso artigo sobre Ella Sri Lanka? Viu como o lugar é realmente uma joia em meio a selva? Ella, Sri Lanka é mais do que uma pequena cidade turística do interior. Lá vais-te sentir como se tivesse sido desenhada para ti. Os destinos, o povo, as aventuras, a comida, as acomodações esperam por ti com o toque de aventura e aconchego. Envolve-te pelos campos enquanto relaxa nas colinas do Little Adams Peak, ou seja, agraciado pela vista das plantações de chás na Nine Arches Bridge. Quem sabe o que desejas mesmo é a adrenalina de fazer trekking na maior montanha de Ella? Bem-vindo a Ella, o que lá encontrarás é tudo isso e um pouco mais que o teu corpo pode suportar. Por falar em suportar, após as aventuras, conhece os restaurantes da cidade e saboreia o melhor da comida local sem restrição. Embora Ella seja pequena, ela guarda belas acomodações aconchegantes com vistas surreais. Ella convida-te para mais uma aventura, só que desta vez mais radical e natural. Escolha como desejas viver esta experiência e faz dessa aventura a melhor de tua viagem ao Sri Lanka. Onde fica Ella – Sri Lanka? Como te deslocares em Ella? Essa cidade conta com aproximadamente 45 mil habitantes e fica a cerca de 200 km de Colombo. Além disso, Ella é o ponto de chegada de uma viagem pitoresca e emocionante de Kandy e caso queiras, é o ponto de partida para Hortons Plains e Nuwara Eliya. Não te enganes, embora Ella no Sri Lanka seja uma pequena aldeia, ela tem muitas opções para fazeres e te surpreenderes com a cidade. Como dizemos, sente-te estimulado a explorar o que separamos para ti com muitas expectativas de te levar a uma experiência surreal. Os destinos de Ella são realmente impressionantes e convidativos para superares as tuas próprias limitações. Vem connosco! O Little Adams Peak é bem menor do que Adams Peak (Pico de Adão). Saindo da cidade até a montanha dura cerca de 45 minutos e com mais 15 minutos já alcanças o topo do pico. Este lugar é ideal para fazeres um trekking bem radical em 2 horas. No decorrer do caminho passarás pelas aldeias locais e verás as belíssimas plantações de chás. À medida que fores subindo a colina encontrarás lugares calmos e tranquilos e ao olhar para baixo verás as estradas pequenas como se tivessem sido desenhadas nas imperfeições da montanha. 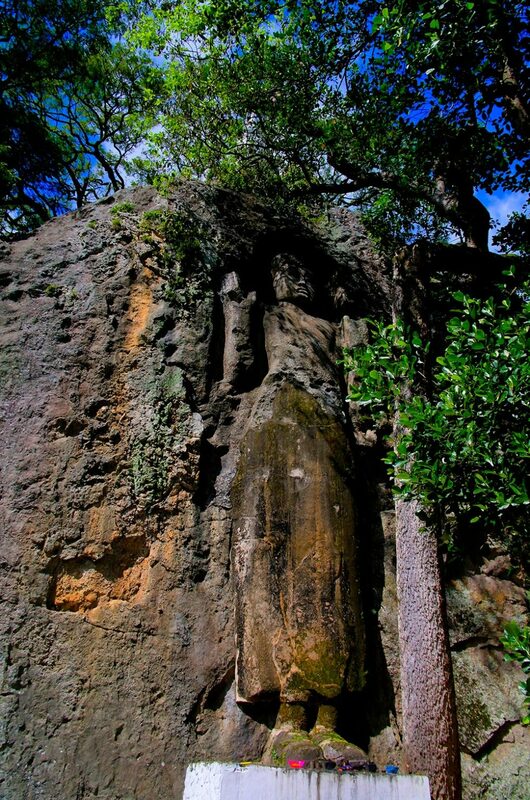 Continua caminhando que chegarás a uma escadaria de terra batida rumo à uma estátua de Buddha. A seguir serás contemplado pelos dois montes onde contemplarás várias paisagens impressionantes. Ao andares pelos picos de Little Adams Peak, anda pela relva (se estiver seca) segurando-se nas pedras com cautela porque a descida em terra batida é escorregadia e corres risco de cair. O ideal é percorrer os três picos e aproveitar as vistas impressionantes e inspiradoras na primeira hora do dia ou ao fim da tarde para contemplar o pôr do sol. 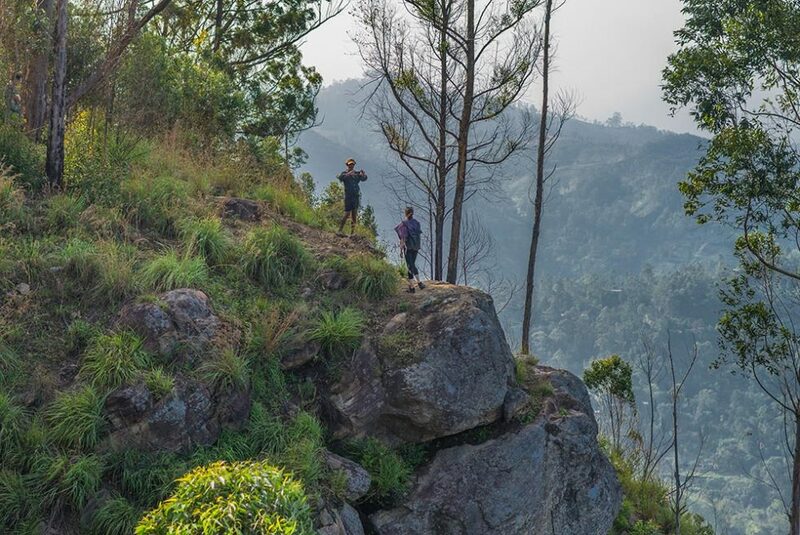 Após superar o Little Adams Peak, aventura-te a um desafio maior e sobe até Ella Rock. O trekking de Ella Rock exigirá de ti energia e disposição. Mesmo se o sol estiver escaldante, serás protegido pelas sombras das árvores. Se fores no final de tarde para passares lá o pôr do sol, irás ficar decepcionado. A colina não possui visibilidade para o lugar onde o sol se põe. O percurso dura 4 horas: 2 horas para subir e 2 horas para descer. Antes de ir precisas de apanhar um rickshaw para a Waterfall Street e dali em diante inicias o teu trekking. Está atento aos guias que estão lá à tua espera, a pedir valores exorbitantes só para te levar ao topo. Podes bem evitá pode arriscar sozinho ou com a companhia de um guia. Tem só o cuidado de escolher um profissional que saiba do que está a fazer. O ideal é perguntares no teu hotel/albergue um guia de confiança. Como o percurso é realmente um pouco complexo, usa a app Maps.me em vez de contratares um guia. Perceberás que esta APP é semelhante ao Google Maps, mas a grande diferença é que disponibiliza trajetos e trilhas que foram partilhadas por outros viajantes. Esta grande diferença vai-te fazer economizar na tua viagem e a tua experiência será ainda mais radical e independente. A famosa Ponte de Nove Arcos (Nine Arches Bridge) foi construída pelos britânicos, inicialmente feita de aço. Ela possui cerca de 220 metros de altura e fica localizada entre Ella e Demodara. Conheces aqueles cartazes e posts que divulgam a viagem cénica de Kandy para Ella? Então, o que verás aqui e um pouco mais à frente da estação de Ella. A caminhada pela floresta dura 30 minutos. Se estiveres no comboio no sentido de Kandy para Ella, e não saires em Ella, vais atravessar a ponte de comboio. Para lá chegares a pé, podes ir até à estação e andar cerca de 40 minutos, o equivalente a 5 km. Agora se estiver a regressar do trekking do Little Adams Peak, aproveita para seguires rumo à ponte (existem sinalizações), o percurso dura cerca de 25 minutos a pé. Durante caminhada será agraciado com uma experiência radical no meio aos campos estreitos e as árvores cercando-te como se te fossem engolir. Ao chegar à ponte será recompensado com uma vista farta de plantações de chás no meio a densas selvas. As imagens são de arrebatar o coração! Logo verás a ponte e terá uma vista global das pessoas. Aproveita para pedir um sumo natural e verificar o horário do próximo comboio. Durante a espera, toma mais um sumo regista esse momento enquanto escutas o som do comboio a aproximar-se das curvas geométricas da ponte. Caso estejas a vir da estação de comboio de Ella, verás o comboio a passar ao teu lado. Ali não faltam pontos de vista interessantes para veres o comboio de perto. Uma viagem a Lipton’s Seat ocupa meio dia. Programa para ires pela manhã ou à tarde. Primeiro apanha o comboio que te levará até Haputale. Depois um tuk-tuk até ao topo onde verás o resultado das poucas sementes que o sr. Lipton semeou em 1890 e hoje se transformou numa das maiores fontes de exportação do país, as plantações de chás Lipton Tea. Das alturas vais-te perder com a imensidão das plantações e de como as mulheres escolhem as melhores folhas para prepararem os chás. A imagem é tão intensa, como se parecece que os campos estão a sorrir para ti de tão bem cuidados. Certamente é mais uma experiência para tu viveres em Ella. A Diyaluma Falls é a maior cascata de Ella. É recomendado que reserves o dia inteiro para usufruir de toda a energia que o lugar tem para libertar sobre ti. Podes sair de Ella e ir de carro, levando cerca de 1 hora. Depois sobe mais 30 minutos até o topo da cascata. Caminha mais 45 minutos e chegas a um lugar cercado pelas piscinas naturais mais surreais da tua vida. Toma cuidado com as placas que sinalizam perigo, infelizmente muitos aventureiros já morreram neste lugar. Aproveita e verifica a disponibilidade para aprenderes a cozinhar as comidas mais saborosas do local. É importante que verifiques a disponibilidade de vagas e reserves com antecedência, geralmente as aulas ficam lotadas. A Ravana é uma cascata cercada por uma exuberante plantação e por uma caverna secreta. A cerca de 10 minutos de Ella, chegas ao outro lado da estrada principal da cidade. Esse lugar é muito popular para mergulhos rápidos já que o acesso é mais simples do que da cascata de Diyaluma. Além disso, poderás visitar a caverna (misteriosa) e um templo que foi construído em memória a Ravana — que roubou a esposa de Sita (história de Ramayana). O lugar não é muito explorado pelos viajantes, mas vale a pena ser visitado na sua viagem por Ella. O Dowa Rock é um templo que fica a alguns quilómetros de Ella. Podes ir de tuk-tuk ou até mesmo a pé. O Templo protege uma estátua de Buddha esculpida na rocha. Ele foi construído com uma stupa no centro que resulta num contraste magnífico. Esse mercado é repleto de pequenas lojas que vendem roupas, legumes, frutas, especiarias e frutas. Ella é uma cidade pequena, percebe-se que as atracções são próximas sendo possível ir a pé, mas não para todos os lugares. Para visitares o Ella Rock, as cascatas de Diyaluma, e outros lugares vais precisar de apanhar um tuk-tuk. Diferente dos outros lugares os motoristas em Ella são bem simpáticos, mas não deixes de negociar com eles. A pensar nisso, preparamos um artigo completo sobre os transportes no Sri Lanka e garantimos que com os segredos que revelamos, estarás bem informado sobre como negociar com os motoristas locais e não ser apanhado de surpresa. Já que estás em Ella que tal passar em Nuwara Eliya? Podes aproveitar e passar por Hortons Plains e até economizar tempo. Com isso aproveitas ainda mais a tua viagem. Verifica no teu hotel um jipe que te leve para Hortons Plains e te aguarde lá. Ele te levará e deixa-te em outra cidade, Nuwara Eliya. Como perceberás que Hortons Plains não tem muitas opções para passeio, a não ser o principal destaque, o parque natural, vai logo de manhã e depois segue para outra cidade. Caso estejas em Ella, aluga um jipe com motorista para te levar até a Hortons Plains e de lá seguir para Nuwara Eliya. Pergunta, agenda com antecedência no hotel onde estiveres instalado e faz uma boa negociação para te levar até Hortons Plains e seguir para Nuwara Eliya. O custo fica á volta de 3000 rupias. Mas de certeza que vale bem a pena, pois não só vais ver um dos mais belos parques no Sri Lanka, como vais ganhar tempo na tua viagem pelo Sri Lanka. Para conseguires aguentar a adrenalina de Ella precisas de estar bem alimentado, mas não te preocupes, Ella tem restaurantes e bares incríveis que servem vários tipos de comidas. Serve-te com as nossas melhores opções. O Cafe Chill é o restaurante mais popular de Ella que fica localizado na estrada principal. Lá servem comidas frias: detox smoothies, hambúrgueres e pizzas. Aproveita para ir durante o dia, pois é agitado mas bem descontraído. À noite dá para curtir uma boa música, conhecer outros viajantes e tomar uma bebida refrescante. O AK Ristoro é um pouco mais distante da rua principal, mas é um bom local para te alimentares em Ella. O In Reincarnation é um restaurante aconchegante que possui três andares. Fica próximo a Ella Spice Garden logo na estrada principal. Aproveite para conhecer assim que voltar da Nine Arches Bridge e Little Adams Peak. Como já foi dito, Ella tem uma das acomodações mais privilegiadas. Em quase todos hotéis e albergues que sugerimos têm vistas para os campos de chás ou para as montanhas que rendem imagens surreais. Confere aqui os melhores hotéis e hosteis em Ella. O Ella Escapade Hostel é um hostel acolhedor. Fica próximo ao Little Adams Peak e do Ella Rock. Os anfitriões são atenciosos e prestativos. Eles servem café da manhã, disponibilizam a piscina e o wifi com alta velocidade. A desvantagem é a distância que embora seja próximo do centro, vais levar cerca de 30 minutos para chegares às trilhas. Mas nada que um tuk-tuk não resolva, certo? O The Residence é uma casa onde os quartos são alugados. 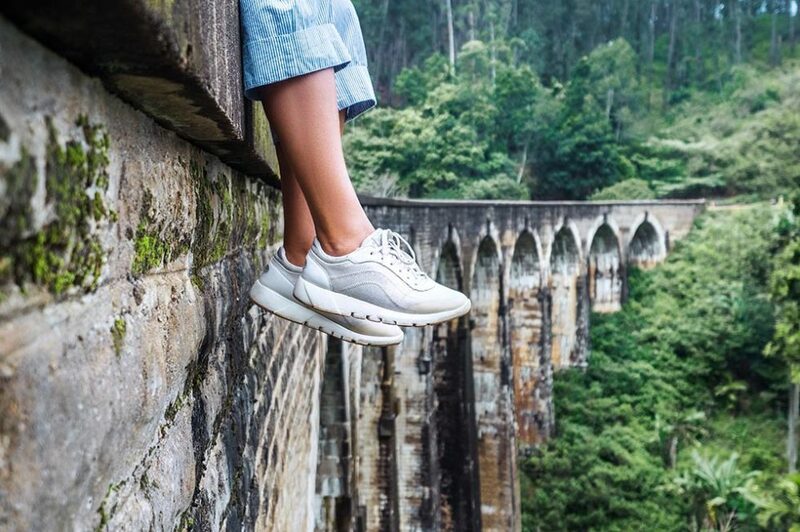 Ela fica localizada perto dos trilhos para Little Adams Peak e Nine Arches Bridge e oferece internet por toda a casa e um belo jardim para relaxares. Também disponibiliza serviço de aluguer de bicicleta ou carro para acomodações particulares. Aproveita e fala com os donos e aluga o tal jipe para te levar o Hortons Plains e Nuwara Eliya (conforme sugerimos mais acima). O Ella Village Inn é um hotel alegre e em cada detalhe demonstra a energia do Sri Lanka. Ele fica localizado numa zona bem central de Ella. O lugar encanta pela simplicidade, as acomodações (cama de casal ou solteiro) são modestas e os banheiros confortáveis. O hotel disponibiliza um cofre e lá podes reservar viagens e passeios. Caso precises, é só solicitar os serviços de lavandaria e lavagem a seco na recepção. Lá vais-te sentir em casa com acomodações bem confortáveis, piscina ao ar livre, serviço de quarto e o excelente atendimento. As instalações do resort são tão relaxantes e ao mesmo tempo luxuosas que, certamente, serão como refúgios para a sua viagem em Ella. O Tenth Hotel é uma acomodação moderna e simples. Fica situado pertinho da estação de comboio. Lá terás opção para relaxar na sala de estar do seu quarto ou sair para respirar o ar do jardim. Disponibilizam os quartos para não fumadores, wifi e estacionamento grátis, além do transfer para o aeroporto. O Ella Jungle Resort é um luxo no meio a natureza. Este resort fica próximo das cascatas, estação de comboio e estrada principal de Ella. A decisão é tua: escolha andar pela selva ao redor, apreciar a vista ou dar aquele mergulho e fazer trekking. As acomodações do resort são confortáveis e pode ficar despreocupado porque vêm com o mosqueteiro para não teres problemas com mosquitos. Em Ella o clima é mais frio em comparação as outras regiões como Negombo, Colombo, Kandy. Isso porque essa cidade recebe muita chuva no decorrer do ano para manter as paisagens com as cores mais vívidas e verdes. Por isso, o verão tem curta duração, céu é mais nublado e as temperaturas variam de 15ºC a 31ºC. Embora possas encontrar chuvas esporádicas, a melhor época para visitar Ella é entre o começo de janeiro até ao começo de abril. Evita viajar entre dezembro e março em que a monção do nordeste chega a cidade provocando tempestades e chuvas acima do normal. Temos um artigo sobre quando ir no Sri Lanka e traça o melhor roteiro de cidades para visitar nesta ilha resplandecente. Como percebeste, Ella é para os amantes de natureza e que têm coragem para apostarem em aventuras radicais. Além disso, é o fim de uma viagem de Kandy para Ella e 100% dedicada ao turismo, por isso são restaurantes e hotéis de primeira linha com preços razoáveis. O ideal é ficar 3 dias em Ella e depois seguir para outras cidades como Nuwara Eliya passando por Hortons Plains (como sugerimos acima). Agora o clima, as pessoas, o ambiente, as atrações são realmente um convite para ficares mais dias em Ella. Gostaste deste artigo sobre Ella – Sri Lanka? Viste como o lugar é realmente uma jóia no meio da selva?